標語 : "A Great Place to Call Home"
^ a b c d e f History of Lakewood. pp.51-53. City of Lakewood. 2015年12月21日閲覧. ^ Smith, Robert L. Cleveland's urban scene gets a boost from young adults moving in. Cleveland Plain Dealer. 2013年2月14日. 2015年12月27日閲覧. ^ Best Places to Raise Your Kids: Ohio. BusinessWeek. Bloomberg. 2010年. 2015年12月27日閲覧. ^ Winton Place Apartments. Emporis. 2015年12月23日閲覧. ^ Mayor of Lakewood. City of Lakewood. 2015年12月23日閲覧. ^ Lakewood City Council. City of Lakewood. 2015年12月23日閲覧. ^ Ward Map. City of Lakewood. 2014年6月. 2015年12月23日閲覧. ^ Cleveland Hopkins Int'l. (Form 5010) Airport Master Record. Federal Aviation Administration. 2015年12月10日. 2015年12月22日閲覧. ^ Full System Map. Greater Cleveland Regional Transit Authority. 2015年12月22日閲覧. ^ 55-A-B-C: Cleveland State Line. Greater Cleveland Regional Transit Authority. 2015年12月22日閲覧. ^ W. 117 - Madison Rapid Station. Cleveland Regional Transit Authority. 2015年12月22日閲覧. ^ Location. University of Akron Lakewood. 2015年12月23日閲覧. ^ Academics. University of Akron Lakewood. 2015年12月23日閲覧. ^ About the District. Lakewood City Schools. 2015年12月23日閲覧. ^ About Lakewood Public Library. Lakewood Public Library. 2015年12月23日. ^ Contact Us. Beck Center for the Arts. 2015年12月26日閲覧. ^ a b About Us. Beck Center for the Arts. 2015年12月26日閲覧. ^ Youth Theatre. Beck Center for the Arts. 2015年12月26日閲覧. ^ Jean Bulicek Galleria. Beck Center for the Arts. 2015年12月26日閲覧. ^ Arts Education. Beck Center for the Arts. 2015年12月26日閲覧. ^ Parks. City of Lakewood. 2015年12月26日閲覧. ^ Home. 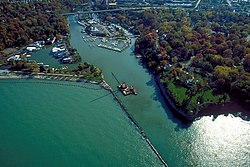 Cleveland Yachting Club. 2015年12月26日閲覧.